George H.W. Bush Falls, Breaks Bone In Neck, But Will Be Fine : The Two-Way A spokesman said the 41st president fell at his home in Maine. As a precaution he was admitted to a hospital. Former President George H.W. 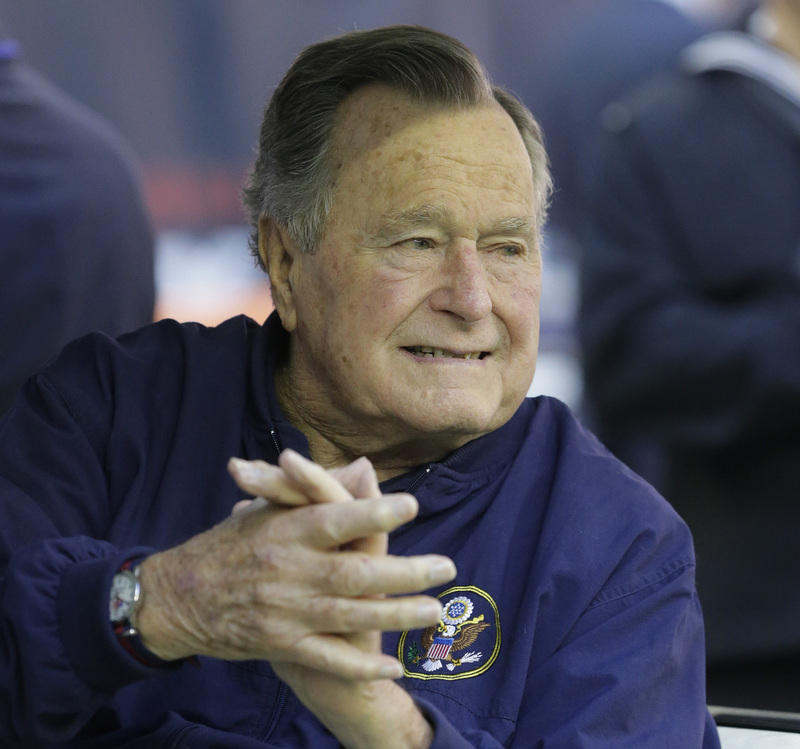 Bush, 91, fell at his home in Maine on Wednesday breaking a bone in his neck. The 41st president was hospitalized, but Jim McGrath, a spokesman, said on Twitter that "his condition is stable — he is fine — but he'll be in a neck brace." Former president George H. W. Bush attends an NFL football game between the Houston Texans and Cincinnati Bengals, in Nov. 2014. "Bush was being treated at Portland's Maine Medical Center, where a children's hospital is named for his wife. "Bush, who has a form of Parkinson's disease that has forced him to use a motorized scooter or wheelchair for mobility, has suffered a few other recent health setbacks. He was hospitalized in Houston in December for about a week for treatment of shortness of breath. He said he was grateful to the doctors and nurses for their care there. "He spent Christmas 2012 in intensive care at the same Houston hospital while being treated for a bronchitis-related cough and other issues. He was discharged in January 2013 after a nearly two-month stay."